Customer communication requires a personal touch. Straight up copy pasting templates or generic responses isn’t going to help you impress your customers. However, in some cases you might need to send automated responses to customer support queries. For instance, you might get a bunch of mails everyday asking for the product manual or how to reset the login password. Responses to those queries are definitely going to be more or less uniform. Or it could be a lengthy pre sales pitch requiring you to explain in detail the advantage of using your product. Instead of the support team coming up with an answer every time, you could use a professionally written sales copy which highlights the features better. That’s when Canned Actions come in handy. 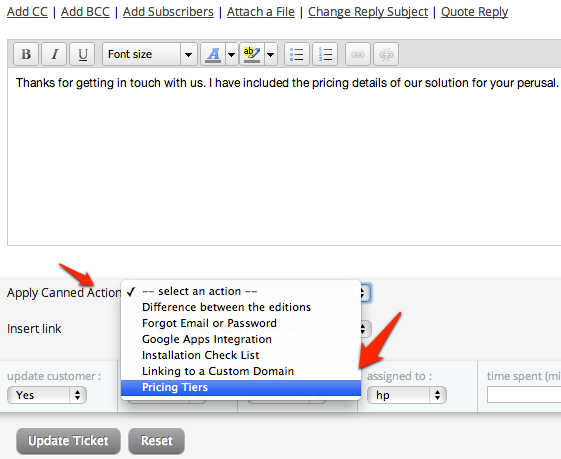 Canned actions of Helpdesk Pilot are stored responses that you could use while replying to tickets. These help cut the hassle of typing in similar responses every single time saving a whole lot of time in the process. To create canned actions, head over to the Manage section. Helpdesk Pilot allows you to create multiple canned actions and select them all later from a drop down. Cool isn’t it? Creating a canned action begins by giving it a name and explaining in brief the context of it for the sake of others. Insert the text of the content and if necessary select appropriate actions to go with the canned action. Options to change the status and priority of the ticket and assigning it to a member of the team are available. For example, you could set to mark all tickets to high priority and assign it to a customer support manager automatically if a canned action for escalation is used. The Helpdesk Pilot team values your privacy and you can pick and choose who gets access to which canned action. Not only that, canned actions can be restricted to certain categories to prevent irrelevant responses sent out by mistake. Yes, we thought of everything to make things easier for you! To see a canned response in action, open a support ticket and hit the Reply button. Use the Apply Canned Action drop down to pick the one that fits the ticket better and then click on Update the ticket button. That’s it, Helpdesk Pilot will automatically perform the associated actions and you can move on to helping the next customer. Do you use Canned Actions already? What additional features would you like to see added to Canned Actions? This entry was posted on Monday, February 18th, 2013 at 11:26 am	and is filed under Helpdesk Pilot. You can follow any comments to this entry through the RSS 2.0 feed. You can leave a comment, or trackback from your own site.